Increasing the powers or prerogatives of the Tax Administration in the monitoring of taxpayers and the battle against tax fraud. The second goal incorporates the reform of tax offences (General Act nº 7/2012 of 27 December, BOE 312 of 28 December 2012). This reform demands a rigorous analysis of the innovations introduced into the new regulations on tax offences and proposals for improvement, with the aim of guaranteeing the safeguarding of the aforesaid pillars: economic progress and legal certainty. 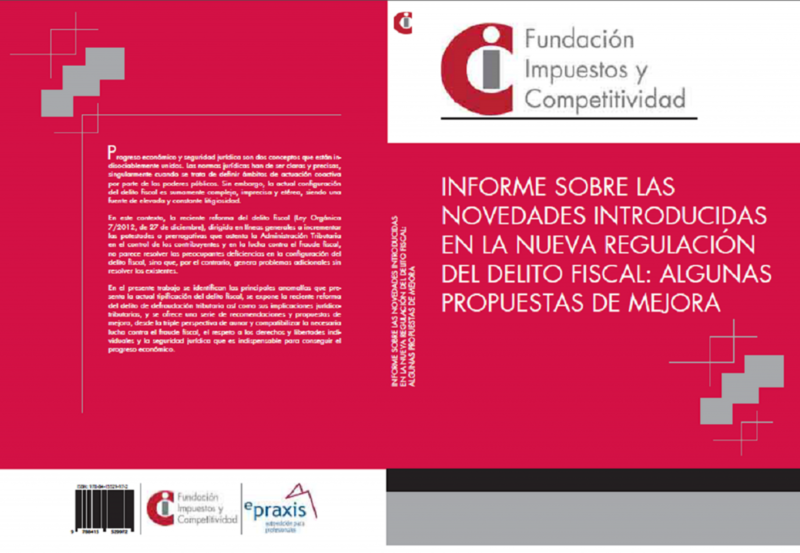 With this objective, the Fundación Impuestos y Competitividad has published, in collaboration with the e-Praxis publishing firm, the book entitled “Report on the innovations introduced into the new regulations on tax offences: proposals for improvement.” Its authors are Miró Ayats Vergés and Jordi de Juan Casadevall, partners of Cuatrecasas Gonçalves Pereira, who have been assisted by other professionals of the member firms of the Board of the Foundation. The publication aims to identify the principal problems presented by the innovations introduced into the new regulations on tax offences and offers a series of recommendations and proposals for improvement, with the aim of protecting legal certainty as a motor of economic development. To do so, it evaluates the new regulations on tax offences, taking as the reference its legislative evolution in Spain and the regulations on this figure in comparative law. The work also specifically discusses the legal problems posed by the new possibility of collection via the administrative channel in the course of tax offence proceedings.